January’s forum discussed the ‘childcare desert’ that Central Oregon has become. The speakers, Kara Tachikawa (Inspire Learning Centers), Ryan Combellick (Hydro Flask), and Carolyn Eagan (City of Bend), showed statistics and discussed challenges and opportunities. A couple of ideas brought up in the audience table talks and during the Q&A included on-site company childcare and intergenerational childcare. To ‘continue the conversation’ we explore a couple of case studies and more ideas from around the country. 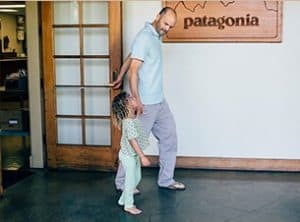 Patagonia’s CEO, Rose Marcario, in a 2016 article from Fast Company breaks down how they found a way to balance on-site child care financially. Tax Benefits – Recouped 50% of the cost of on-site childcare through a yearly tax credit and deduction of unrecovered costs. Employee Retention – Recouped 30% of expenses based on the value of replacing an employee. Employee Engagement – Recouped 11%. This measurement is based on studies of employees who partake in the on-site childcare are more satisfied with their positions. Higher engagement leads to better customer service and business performance. Patagonia estimates that they recover 91% of the measurable costs annually. And that doesn’t consider the intangible benefits: more women in management, greater employee loyalty, and a stronger workplace culture of trust. They actually wrote a book on it! Many other larger corporation has instituted on-site childcare including Nike HQ in Beaverton; Clif Bar & Company HQ (400+ employees) in Emeryville, California, and Home Depot HQ in New Jersey to name a few. Help with Back Up Care – Brigham and Women’s Hospital, in Boston, offers a reduced rate for emergency care at home through Care.com. 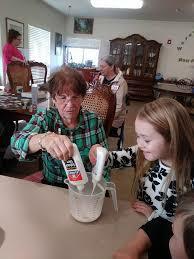 In 1991, the Mount’s Intergenerational Learning Center was established in Providence Mount St. Vincent, a senior living community in Seattle, Washington. The Learning Center is a licensed childcare center, and preschool with up to 125 children ages zero to five that shares the 300,000 square foot facility with 400 older adults. Numerous studies have linked social interaction with decreased mental and physical declines in older adults. The benefits to the children include learning acceptance to the aging process and people with disabilities and receiving and giving unconditional love and attention they would not get in a traditional childcare setting. The Learning Center is staffed with qualified teachers, and senior and children gather at planned activities such as lunch, storytelling, or just visiting. Learn more about the program in this article in The Atlantic. Intergenerational childcare dates back to 1976 when a Japanese man named Shimada Masaharu combined a nursery school with a home for the aging in Tokyo. The idea filtered into the U.S. around 1998 and today you can find more than 500 across the country *** including in Redmond, Oregon! * Fast Company, What will it take for employers to offer on-site daycare?, February 16, 2016. ** Harvard Business Review, How Some Companies Are Making Child Care Less Stressful for Their Employees, April 14, 2017. *** White Paper – Making the Case for Intergenerational Childcare: How adults 50+ can support home-based and family childcare centers. By Madeline Dangerfield-Cha and Joy Zhang, Encore.org. Talk to your employer about options. Watch for legislation that addresses the child care shortage and speak out – both in Salem and locally. For those who can provide space, invest, or otherwise want to impact child care in the tri-county region, please contact Karen Prow, NeighborImpact Child Care Resource & Referral, 541-323-6557, karenp@neighborimpact.org.